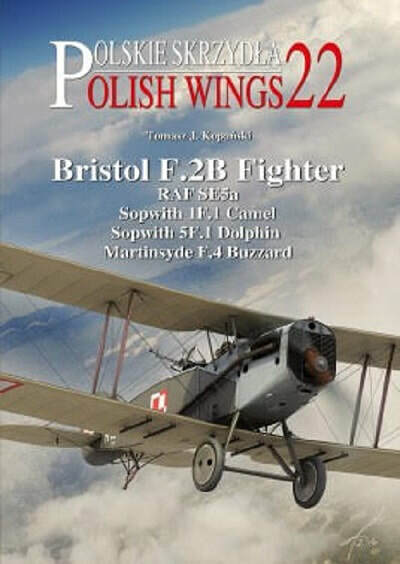 This book in the popular Polish Wings series is on the famous British WWI fighters in Polish Air Forces. It covers the duty of these aircraft during the Polish-Bolsheviks War and early 1920's. In October and November 1918 Poland regained independence ater 123 years of occupation by Russia, Germany and Austria. From the very first days of its revived existance, the Polish state had a difficult time. To defend its borders it had to fight virtually all its neighbours: Germans, Lithuanians, Russians, Ukrainians and Czechs. Rapid expansion of the army was essential for success. Air units were among the first Polish military forces established in November 1918. Soon after the air bases of the occupying forces were captured, the Polish-national officers of the former occupant's air forces started to establish air formations. This was a spontaneous action, not co-ordinated by any central authorities, as these simply did not exist at that time. The first to come into being was the Oddzial Lotniczy Lwow (Lwow Air Unit) formed on 2 November 1918. It was this untit that, on 5 November, flew what would be the first Polish Air Force combat sortie, bombing Ukranian troops in the part of the city held by them. This book was printed in Sandomierz, Poland by Stratus Pulblications. Stratus is an associate of Mushroom Model Publications (MMP) and they print all of MMP's books there in English. They also do their own line of books in Polish and English. The Polish Wings series is Stratus's. The book is soft cover of 80 pages in 8 1/2" x 12" page format. The cover art is a color illustration of a Bristol F.2B fighter flying above the clouds. It has a dark green fuselage with a battleship-grey cowling and light-tan below the wings. Below the cockpit, in the Polish language, in white lettering it says "Flying without passenger or equivelent load is prohibited". This is followed by the Polish red and white checkerboard insignia, a white no. 20.48 and a larger white no. H-1279. Under this larger number is a small white "Lift here". The aircraft is fighter number 20.48 of 1 Eskadra Wywiadowcza, northern section of the Polish-Boshevik line, forward airfield at Dojlidy near Bialystok, September 1920. This aircraft is again illustrated in color on the back cover of the book and as a color 3-view on pages 44 and 45 in the book. The book contains 144 black and white photos, the two color illustrations on the cover, 2 color photos of restored Bristol F.2B's in Museums. Page 2 in the book shows 6 cover arts of other other aircraft books in the Polish Wings series: Polish Wings no. 13 on the Supermarine Spitfire IX 1942-43, Polish Wings no. 16 on the Supermarine Spitfire XVI 1944-46, Polish Wings no.18 on the Breguet 19, Farman F68 Goliath & Amiot 123, Polish Wings no 19 on the Mig-17 & Polish Versions, Polish Wings no. 20 on the Yak-1,3,7 & 9, Polish Wings no. 21 on the Mig-29. Below these is a color illustration of a decal sheet no. D.094 by Model Maker Decals for the Bristol Fighter F.2B in Polish service with Model Maker's street address in Poland, their phone number and web address to use to contact them and buy the decal sheet. There are 4 information lists in the book, 24 color side profiles of the Bristol F.2B and 2 color above and below views of it, a color illustration of a skull insignia used on a Russian Bristol, the color emblem of Wyzsza Szkola Pilotow in Grudziadz. a color profile of a Martinsyde F.4 Buzzard, 2 color profiles of a Sopwith 5F.1 Camel and a top and bottom view of it and 2 color profiles of a R.A.F. SE-5A with a top and bottom view of it. This is a neat book about the early Polish Air Force. It will be of interest to both modelers and historians alike. I want to thank Casemate Publishing, the North American distributor of Mushroom Model Publications (MMP) and Roger Wallsgrove, Editor-in-Chief of MMP for this review sample.